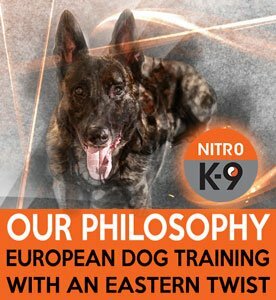 The Nitro K-9 training philosophy is based on European dog training, underpinned by the concept of yin and yang—or the harmony of opposites. It combines the structure of formal training with the power of balanced, productive energy between dog and handler. The result? You’ll begin to communicate with your dog in ways you never thought possible. Your dog’s focus will increase—and the desire to please will go through the roof. And you will bond like never before. What is European Dog Training? The difference is that in Europe, there’s a long history of dog training. It’s ingrained in the culture. And although there are many different types of training systems, they all share one basic premise: Repetition=results. I have a great love and respect for the European dog sports. My favorite European handling system is from Holland and is called K.N.P.V. My second favorite is called French Ring and was created in France. I also love to watch and practice various elements of a German dog training system called Schutzhund. I love the stylized drills and training structures they provide, and have trained with trainers and groups from the systems mentioned above, as well as Mondio Ring and Belgian Ring. The Nitro K-9 training system includes the best elements from all these training systems. This is professional canine training at its best, similar to training police and military dogs. The result is a dog that you can take anywhere. To achieve this, we train our dogs in the real world around maximum distractions. Why? Because dogs need to be trained to function in the world they live in! To be successful at any type of handling, you and your dog must communicate and share. We tell our dogs what we want them to do. And we want to feel what they feel to better understand them and ourselves. The yin and yang on our logo represents our respect for the harmony of opposites and how this applies to our dog training. While yin and yang are opposites, they depend on each other to form something greater, like day needs night. Moreover, together they form a unique and wonderful energy. From the minute you bring your dog home, he or she is in a state of yin and yang with you. Yin and Yang are never static, but in a constantly changing balance. How you respond to your dog and the energy exchanged in training defines your communication. You will learn a lot by closely watching how your dog responds to training. For instance, some dogs like a gentle correction, while others like a hard one. This does not mean that a harder correction produces pain: it just means some dogs like a harder nip. Sometimes a spade is just a spade. Ultimately, using a correction with adjusting force is about finding harmony and balance. We need to find the correction that reaches the dog without inflicting pain. We strive to apply gentle corrections and keep ourselves open to what your dog needs at that exact moment. He or she may need a fast correction or a very slow and gentle one. The result of this correction produces the harmony of opposites. It is amazing how most dogs instantly relax and overcome crippling anxiety, horrible leash aggression, and many other unwanted and scary behaviors. How do you feel about food training? We do not use food in exchange for behavior. We exchange love and praise for behavior and specific leash techniques. We believe food training stifles a dog’s desire to please in the long run, and creates a terrible false illusion of good behavior. The idea of a dog sitting and then waiting for payment in form of a food reward is an idea we totally and completely reject. Our dogs behave because they want to! Anybody can teach a dog to sit for a snack, but very few can train a dog to be alert and responsive in ANY environment and in any place you take them without food. We can and our dogs do! That said, we are not against using food in particular circumstances. For instance, food can be an effective bridge to reestablish trust with terrified dogs. We’ve worked extensively in animal rescue, and always use food and praise with dogs we don’t know or has serious issues. Again, it’s yin and yang—looking at the whole dog. We also think using food is great for teaching lure-based fun tricks. But food should not be used for professional obedience training. Why do you use a prong collar and not something else? Take a look at how dogs communicate. From birth, they use light and fast nips to each other from birth to communicate all sorts of things, like showing affection, dominance, a correction to another dog, and much, much more. (Please note: they don’t use food.) When you use a prong collar to simulate how a dog talks to another dog, you communicate more effectively with your dog—and you get results! The prong collar is for communication and training purpose only. Properly used, it is not cruel. It is never used to hurt dogs or used in anger or inhumane ways. We have trained over a thousand dogs using this a prong collar, a leash, and our focus on the harmony of opposites. Despite the ugly pictures people paint about prong collars, they are not cruel, mean, or negative in the least! It is the responsibility of the dog’s handler to learn to use the collar to achieve results properly. We believe in personal responsibility and consequences for our actions, and would never use a training tool we were not properly educated to use. Can a prong collar hurt my dog, like, for real? Every training tool carries risk of injury and every tool should be watched closely. Prong collars can and do hurt dogs when misused and we would never let that happen to you or your dog. We know how to use a prong collar! Occasionally, we see minor skin irritation in weaker or dogs without much fur. We simply add a scarf or even some vet wrap to be sure they are well protected. More rarely, we see minor fur loss, like you would see from just about any training chain. This usually clears up fast. Also, remember most leashes and prong collars sold at pet stores are substandard and poorly made. It is critical you buy the best gear for your training. The leashes we recommend are cheaper and better made by a factor of about 1,000! So are our prong collars. We can show you where to buy them, or you can buy them from us. What about Haltys or Gentle Leaders? We do not use pull harnesses, nose attached non-pull items, or choke chains. The majority of my clients have tried these, and their dogs run in terror when their owners pull them out to go for a walk. There’s a good reason for that. All these devices cause tremendous pain. “No Pull” harnesses pull the shoulders apart every time the dog pulls against it, stretching the ligaments and joints in the shoulders. Over time, they cause calcium deposits to form between the fronts of the shoulder blades. Choke chains can quite literally choke a dog (compared to a prong collar, which can only tighten a certain amount). We particularly dislike nose harnesses, like the Halty or Gentle leader. These devices pivot the dog’s entire weight on its nose and causes tremendous damage and can leave them in constant pain. We do not feel that is necessary and it is only a short-term fix because most dogs begin to ignore these devices in a short time period—especially after the damage to their bodies and minds has been done. All these devices can cause association confusion in your dog and therefore cause leash aggression, anxiety, and fear every time you walk your dog. If a device is marketed as “no pull,” a good rule of thumb is to ask yourself why? Generally, the answer is simple: it causes pain. Isn’t it better to teach your dog how to walk on a loose leash? Isn’t that more “positive” than using tools that can inflict damage and trauma to your dog? Is your training abusive? Is this force-based training? We are very frustrated with so-called positive trainers who claim that using a prong collar or corrections is force-based, abusive, cruel, and any of the other invectives they throw at us. Over the years, there’s been a lot. And yet, we continue to do what we do because it works. We are never extreme or violent in our training methods. And we do not ever pull a leash in anger or upset. If we did, nothing would work and we would have lost touch with these powerful technical handling concepts. Check out our videos on our Facebook page. These dogs are having fun. They love training. They come running when the prong collar and leash comes out.